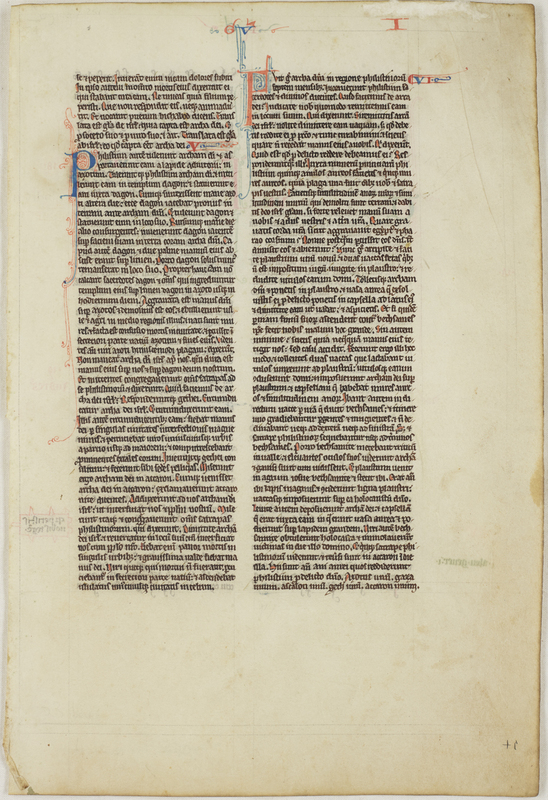 Currently on display in the Special Collections reading room, in the Central Library, is a single leaf from a 13th century Latin Bible generously donated to the Library by Keith Stuart late last year. Stuart, an archivist trained in biblical research presented a paper to ANZBS Conference in 2010 which included a detailed description of the leaf. 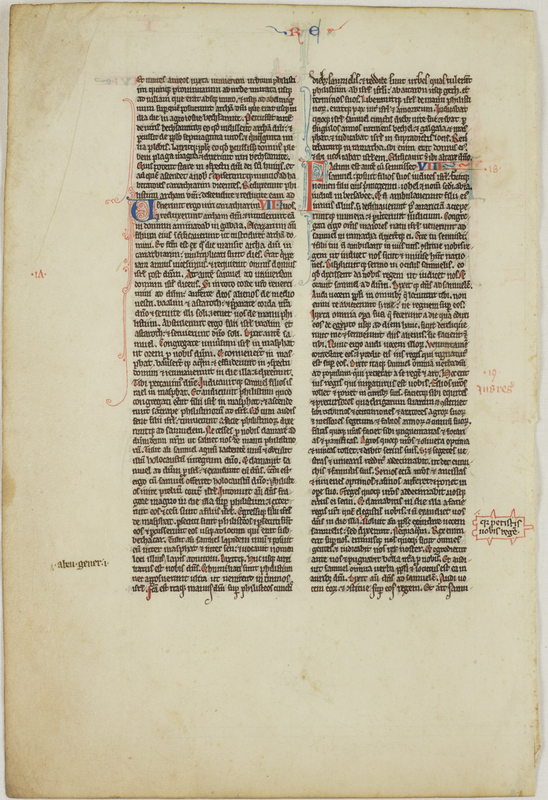 Described as a typical leaf from a Paris manuscript Bible it is roughly the same size as a sheet of A4. This is much larger than a Bible we may be familiar with pulling from the back of a pew, but is not especially large for a medieval Bible. As Stuart notes, the size of Bibles became smaller with the rise of Mendicant orders and their travelling preachers, so portability became important. The text is in Latin, from Saint Jerome’s translation of the Hebrew and is from the first book of Kings, chapter 4 verse 19 to chapter 8 verse 22. It tells of the Ark of the Covenant in Philistine through to Israel’s demand for a King. 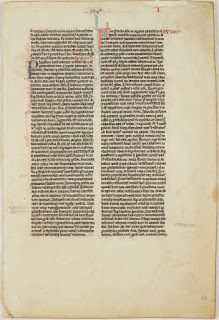 The leaf provides a significant example of a leaf from a thirteenth century Bible. It is hand written in a small gothic script on thin vellum. The thinness of the vellum can be seen in the text showing through from the other side. It also reflects the artistry of books of the period contrasting coloured lettering and fine pen work. The purchase of single leaves or fragments from medieval manuscripts dates back centuries, following on from the trade in ecclesiastical relics. Stuart purchased this leaf from Paulus Swaen Old Maps and Prints, a reputable dealer, who claim to be the first internet auction house specialising in prints, maps and medieval manuscripts. Whilst there has been some controversy about the role online auction sites play in the trade of cultural materials, I don’t believe the internet can be blamed for this. As with many things the internet has just made this more accessible and enabled people with similar interests to connect. Concerns about the authenticity and provenance of medieval manuscript fragments certainly predate the internet. Assurances of authenticity have been sought from rare book dealers and antiquarians since the inception of the trade, as Christopher de Hamel writes. Medieval relic collectors felt the same need for assurance around authenticity (Disbound and dispersed, p.22). Fragments will often be traded as they are but sometimes this trade involves breaking-up of larger works. Breaking-up a complete work is frowned upon by book collectors, but given the age of these items sometimes only an incomplete work will survive. Often times a seller will realise a far greater profit by breaking-up the incomplete text and selling it leaf by leaf. This practice is illegal in Italy, where there is legislation in place protecting cultural properties including manuscripts, documents and books. In the case of rare books a niche genre has been created through the breaking-up of books: the leaf book. Bibliographer Francis Fry, who created the first generally recognised leaf book, provides the title to this blog post. There is a moral conundrum over the breaking up of rare books and manuscripts. Fry encapsulates one side of the argument for which the goal was to enable as many people as possible to enjoy these fragments. The other side of the argument is that breaking-up books is nothing short of vandalism as it destroys the original book and it leads to a loss of information around the provenance, binding and historical context of the publication. It seems unbelievable today but one leaf book was even created from an incomplete copy of a Gutenberg Bible. De Hamel notes that leaf books have not been as popular for medieval manuscripts because exact dating of manuscripts is very difficult. In addition to this leaf on display, Auckland Libraries holds the largest and most diverse collection of medieval manuscripts in New Zealand. We’ve recently added digital versions of a number of these to our Manuscripts Online database which you can browse by selecting medieval manuscripts from the collection drop down box. Ref: Bible. N.T. Gospels. Greek, ff.4v, Sketch of St Matthew, 1175-1225, Sir George Grey Special Collections, Auckland Libraries, Med. 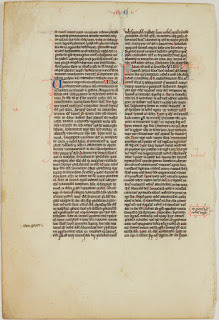 MS G.124. So, in the spirit of Francis Fry and other bibliophiles, don’t settle for this description but come into the Central Library and see this leaf and our other medieval manuscripts for yourself. As Stuart writes in his paper seeing documents over 750 years old is very rare in New Zealand and you can appreciate the touch, feel and smell of the text as an object.